Floater complete Boleite crystal with a very well balanced development of the octahedron and the cube faces that are very bright. We’ll send the sample in its original Perkin’s box from the R.J. Noble collection, also containing the collection label in which it appears that it had previously been in the “Bunk” Melanson collection. 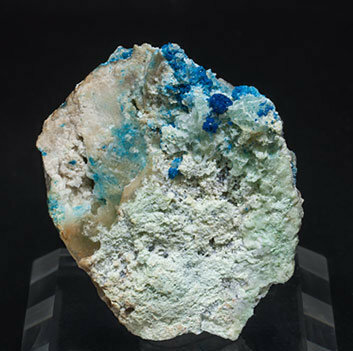 Great crystal that is intensely blue and has very brilliant faces, so this Boleite is very representative of the species and locality. 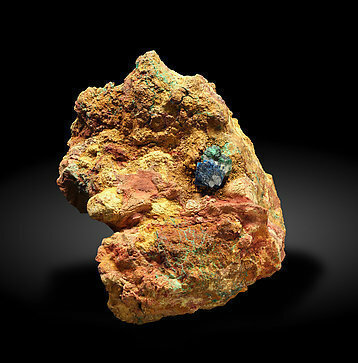 Boleite with Atacamite-Paratacamite on matrix. Coming from recent finds in the famous Amelia Mine due to work on the dumps there. A novelty at Tucson 2016. Aggregates of small and very sharp cubic Boleite crystals that are translucent, very bright and on matrix, with Gypsum and Paratacamite. 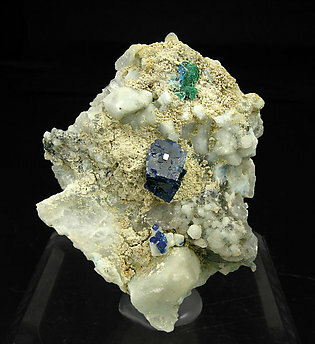 The sample is from recent preparation works at the mine. A novelty at Tucson 2010. 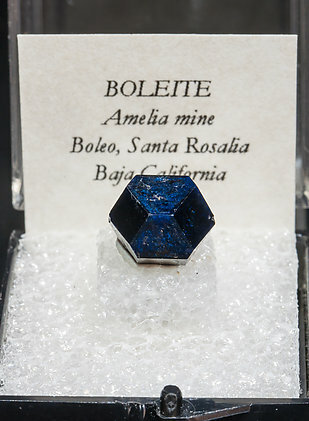 This group of cubic crystals of Boleite was discovered in recent work in the classic Santa Amelia mine. 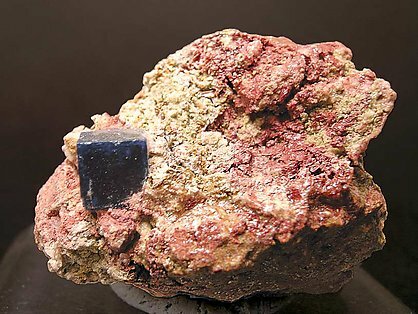 The crystals are sharp, with very well defined faces and edges, bright and with a deep color on a Quartz matrix rich with Gypsum, with minor Brochantite.